Flinders was born in Lincolnshire on the 16th. of March 1774, the eldest child of Matthew and Susannah Flinders. As a young man he had two ambitions, to be both famous and rich. He looked to the Royal Navy for a career, joining HMS Scipio in May of 1790, at the age of 16. His cousin Henrietta Flinders as a governess in the Pasley household had introduced the young Flinders to Thomas Pasley, Captain of Scipio. Captain Pasley now recommended the young man to Captain Bligh in 1791, he was about to sail on his second expedition attempting to ship breadfruit plants from Tahiti to the West Indies, to try and grow a cheap food there for the plantation slaves. Under Bligh’s guidance, Flinders learned the arts of practical navigation and chart making. After two years away, Flinders came home in 1793, to rejoin Pasley, this time in HMS Bellaphon, and seeing action against the French at the Battle of the Glorious First of June. Now Flinders went after further promotion by joining the crew of Reliance, being the ship to transport the new Australian Colony’s second Governor John Hunter. 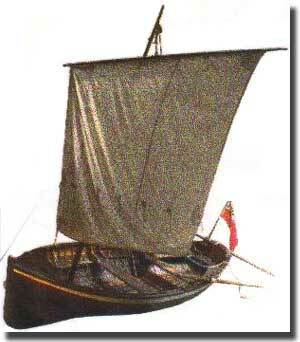 Samuel, his 12 year old brother was also included in the crew of this vessel, and they arrived in Sydney on the 7th. of September 1795, after a voyage out of 6 months. At this stage, the new outpost of Britain at Sydney Cove and at Parramatta numbered 3,200, with 2/3 of this total being convicts. The years 1795 - 1796. It was in Reliance that Flinders met the 24 year old George Bass, and immediately took to this 6 foot tall surgeon. Joined by William Martin, the 14 year servant to Bass, both Flinders and Bass took off in a small boat 2.5 meters by 1.5 meters, Tom Thumb, which belonged to Bass. It carried both a single sail and mast, over 9 days they headed south to Botany Bay, and travelled 32 kilometers up the Saint George’s River. In March of 1796, after Reliance had returned from a trip to Norfolk Island, the two friends, in a second Tom Thumb, this one built in the Colony, set off again, sailing south, by the end of March thay had reached Port Hacking. The weather had been none too kind, they coped with storms, a ship wreck, and encountered indigenous people at Lake Illawarra, sailing as far south at today’s Port Kembla. Bass now went off without Flinders on the 3rd. of December 1797, in an open boat 8.5 meters long, with a crew of 6, sailing south. He charted the coast as far as Western Port in Victoria, but dwindling provisions forced Bass to retrace his steps to Sydney Cove. Flinders with Bass away, and using the Colonial Schooner Francis, in February 1798 reached the Furneaux Islands south of the mainland coast, he believed that Australia and Tasmania were separated by a strait, but this could only be proven if he sailed right around Tasmania. October 1798 - January 1799, when only 24, Flinders and Bass sail round Tasmania. Taking the 10.7 metre long Norfolk, with a crew of 8, Flinders and Bass set out to prove Tasmania was indeed an Island. As a team these two men combined brilliantly, Flinders looked after charting the coast line whilst Bass explored ashore, describing both the vegitation and the animals they found. On the 3rd. of November 1798, Norfolk entered what was to become the Tamar River in the north of Tasmania, and over 17 days, Flinders surveyed the port, and Bass explored the surrounding countryside. They then sailed west, to reach the western extremity of Van Dieman’s Land, and turned south, rounding and naming Cape Grim ( the north west Cape of Tasmania ) and sailed for 4 days down the west coast. Next, they turned east, spending time at the estuary to the Derwent, and then sailed up the east coast, to arrive back at Port Jackson on the 3rd. of January 1799. This epic journey proved beyond any doubt that Tasmania was separated from the Australian mainland, and indeed was an island. At the suggestion of Flinders, Governor Hunter named the new strait between Tasmania and Australia, Bass Strait. Off to London went Flinders’ chart of both Bass Strait, and Tasmania, to be published in June of 1800. 1799 July/August. North to Hervey Bay. Flinders joined by his brother Samuel, now 16, with a crew of 8, sailed north in July of 1799 up to Hervey Bay, their ship, the Norfolk, Hunter had told Flinders to seek out any rivers that reached inland. 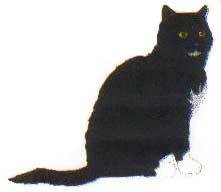 A new crew member was Trim, the intrepid cat belonging to Flinders, and now destined to share all voyages with his master until his death in 1804. Trim was an exceptional rat catcher, and stoutly defended the bags used to enclose the ship’s bread aboard Norfolk. An ambitious Flinders - September 1800. George Bass had left the Colony in May 1799, to become a merchant, and for a while Flinders toyed about emulating his friend, but, by September 1800 he had decided that fame could hinge upon him completing the European exploration of Australia. Charting this land could supply the mortar for building up the Empire, and perhaps, even elevating his name to the same heights enjoyed by Captain James Cook. Bypassing the Admiralty, Flinders went directly to Sir Joseph Banks, the eminent botanist who had accompanied Cook on his epic voyage that discovered the East coast of Australia. Flinders suggested that he be sent to Australia to undertake surveys of that newly settled land. Banks became responsible for having Flinders given command of Investigator, 30 meters long with an 8.5 metre beam, and at that time England was at war with France. Flinders chose a young crew of 88 volunteers aged between 20/25. 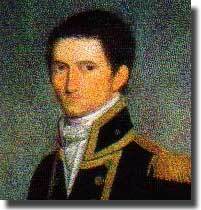 His brother Samuel was appointed second Lieutenant, and a future Lieutenant Governor of Tasmania, John Franklin then 15 years old, was a Midshipman. Trim, the faithful cat, now 4, was also on board. Flinders marries the former Ann Chappelle. Ann Chappelle was some 16 months older than Flinders, they had met before he sailed in Reliance, but, at this stage had not seen each other for 5 years, Flinders had tried to keep the relationship alive by naming a mountain after her, and also an island in Bass Strait bore her name. Now, on the 17th. of April 1801, having again met only once earlier in January that year, they married. Matthew had indicated he would take his new bride with him in Investigator, on this voyage of exploration to Australia, but when the crunch came, he could not keep that promise, it would be 9 long, weary years, before he came home again! The Australian author, Ernestine Hill wrote a book about Flinders, calling it My Love Must Wait, it is easy to see how that title was chosen. Salary of the Naturalist and Artists compared to Flinders’ remuneration. It is interesting to note the various level of salary paid to different members of this expedition to Australia, Flinders, although in command, was paid only 250 Pounds per annum, the Artists employed to record the landscape, flora and fauna, received 315 Pounds a year, and the Naturalist came off best of all, with 420 Pounds a year. Flinders took his ship out of Portsmouth on the 18th. of July 1801, and headed for Sydney, but it took until the 6th. of December to sight the South West corner of Australia, Cape Leeuwin. From here they sailed eastwards, it was thought an Inland Sea might divide the continent into two, and this myth was entertained by future explorers for many years. It was the 20th. of February 1802 when Flinders anchored his ship off the entrance to Spencer Gulf, here perhaps was the lead in to either a river, or to the Inland Sea, even a passage leading up to the Gulf of Carpentaria at the extreme north eastern part of this new land, but no! it proved to be only Spencer Gulf, and 9 days were spent at Port Lincoln. Kangaroo Island was raised and named on the 20th. of March, still proceeding to the east, Flinders was suprised on the 8th. of April, to come upon another sailing ship, coming from the east, he was after all, not alone on this distant and remote ocean! This ship was the French Geographe, under the command of Nicolas Baudin, he had left France in October of 1800, having the same objective as Flinders, that of charting Australia, the French had been sniffing around the eastern part of Australia at the same time as Cook, and, in fact had only just been thwarted by him in being the first to arrive there. To suitably mark their historic meeting, Flinders named the place, Encounter Bay. On the 26th. of April, Port Phillip Bay was entered, still no way to an Inland Sea. However, when Sydney was finally reached on the 9th.of May, Flinders to his chagrin, learned he was not the first into Port Phillip, John Murray in Lady Nelson, had beaten him by some 10 weeks. Charting the East Coast of Australia/ Gulf of Carpentaria. Now Flinders made his way slowly northwards, his ambition to improve on the charting work carried out by James Cook. 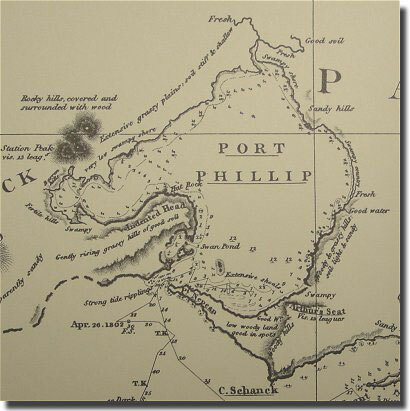 The charts of the Gulf of Carpentaria prepared by Flinders were to serve sailors in that area for the next 150 years. He now navigated right down the west coast of Australia, turned east into the Southern Ocean, crossing the great Australian Bight to reach the south east corner of the continent, sailing north to Sydney arriving on the 9th. of June 1803, to completely circumnavigate Australia, but 5 crew members had died. A truly remarkable feat, when his small ship had only wind power to propel her, and unknown currents ever ready to throw the ship off the required course that Flinders would set. Over the 17th. Century, the Dutch had charted much of Australia’s coast line, but had not covered the east coast, part of the southern area, and the north of Tasmania. Cook had of course in 1770, sailed the east coast, but now, Flinders had filled in all the gaps, both in the Norfolk over 1798 - 1799, and now in Investigator over 1801 - 1803. He had proven Tasmania was in Island, had confirmed there was indeed no Inland Sea to divide this vast continent, and he had sailed right around Australia, a most remarkable achievement. Flinders took passage in Purpoise as a passenger en route to England on the 10th. of August 1803. But on the 17th of August, the ship came to grief, and was wrecked in the Coral Sea. Flinders with 12 others took the ship's cutter, sailing her back to Sydney to send off a rescue party, now three vessels, Rolla, Francis, and Cumberland, all left Sydney on the 20th. of September, bound for Wreck Reef, to pick up all the remaining survivors from Porpoise, reaching them on the 7th. of October. Some joined Rolla, on her way to China, other chose Francis returning to Sydney, and 10 joined Flinders in Cumberland. "This ship was both very leaky and exceeding crank." By early December, Cumberland was in such a poor state that Flinders was forced to call into the French possession of Mauritius, an island in the Indian Ocean about 1,800 kilometers east of Madagascar. Here he hoped to pick up replacement ship, alas! he was branded a spy by the French authorities and slapped into detention, destined to languish here for the next 6.5 years. At Mauritius, Flinders drew his map of Australia, finishing this monumental work by August 1804, but his chart had to wait until 1814 for the rest of the world to sight it, when it was published in London, as Terra Australis or Australia. The Governor of Mauritius, Charles Mathiea Isodore Decaen. 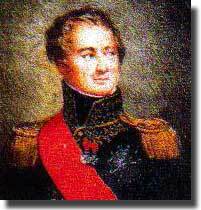 The 34 year old Governor here is Mauritius was Charles Mathiea Isadore Decaen, the man who imprisoned Flinders, after branding him as a spy, of course at this stage, France and England were at war. Flinders was not freed until March of 1810, and finally reached Portsmouth on the 24th. of October. Only eight months after his release, the British captured Mauritius. On his arrival in England, Flinders hastened up to London, to at last be reunited with his wife Ann, the day after he had landed at Portsmouth. He had not heard a word from her for 4.5 years, and had not seen her for a lonely 9 years, he really must have wondered just what to expect, but no report that I have I have seen makes mention of the reunion. Flinders’ health was poor, he suffered from gravel stones, in his bladder. His book: A Voyage to Terra Australis, with an accompanying Atlas, were published on the 18th. of July 1814, Flinders only just living long enough to see his masterpiece come to fruition, he died the next day, only 40 years old. Anne lived on another 40 years, she waited so long, for so little, she had given birth to their daughter Anne, on the 1st. of April 1812. 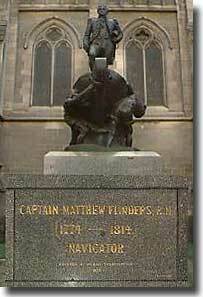 In this year of 2002, as thousands of Melburnians rush past this statue each day, as they go about their business, I doubt many of them would pause to remember the courage and achievement of that magnificent master Navigator and Explorer, Matthew Flinders, and his Surgeon friend George Bass. Flinders standing in his boat and being pulled ashore by two sailors. It was erected in 1925 and paid for by Public Subscription. It has a copy of the Flinders chart on which he first names my country Australia, and on the 14th. of November 2004, it will be the 200th. Anniversary of the first time anyone called it Australia. On that day, in the Great Hall at Parliament House Canberra, a copy of that Map/Chart will be presented to the Commonwealth of Australia Parliament, hopefully by the Governor General. Would you believe that this Map/Chart has never before been given to, or displayed in our Parliament House? A Bill Fairbanks, who found this map in UK and lives in New South Wales, and is the driving force in having this day celebrated, had read my piece on Flinders on AHOY , contacted me this morning by E-Mail, and asked me to telephone him, this I did, to have a long conversation with him on this subject. I had written about Flinders, that he was the one person to literally " Put Australia on the Map."